Scandal Photos from "Ride, Sally, Ride"
Check out these photos from Scandal Season 3 Episode 11, "Ride, Sally, Ride" scheduled to air Thursday, Feb. 27th on ABC. Sally Langston's got a lot on her mind these days. Is she repenting or planning her next attack on Scandal? 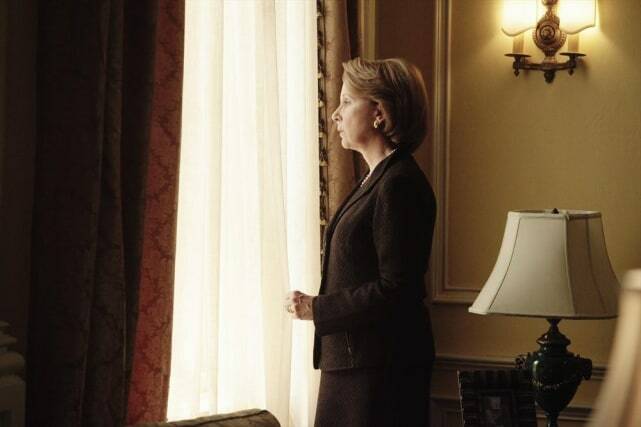 Sally's being advised to run for president but what if the truth behind her husband's death comes to light. Scandal returns Thursday, Feb. 27th on ABC. Sally looks so put together. It's as though stabbing her husband to death didn't even faze her. Maybe they're praying for Cyrus to keep his mouth shut. They don't even know that David Rosen may be uncovering the truth this very moment. Is Sally praying for forgiveness, or to find a way to make this tragedy work for her campaign? We'll find out when Scandal returns Thursday, Feb. 27th on ABC. How much prayer does it take to be forgiven for bludgeoning your husband to death? "Ride, Sally, Ride" is the 11th episode of the show's third season. Scandal Sneak Peek: Will James Snitch? Scandal Midseason Premiere: First Look! Scandal Return Teaser: Total Insanity Ahead!